That’s all of interest to the Office of the Public Guardian (OPG), because higher life expectancy is associated with higher rates of dementia, and anticipation of dementia is one of the main reasons people create a lasting power of attorney (LPA). Such issues are particularly to the fore during this week, Dementia Awareness Week (15-21 May), of course. We’ve uploaded the leaflet to our website and we’ll be sending it out to our stakeholders, including charities and legal and medical professionals, to distribute to their users as they see fit. The leaflet has two aims. First, we want to reach people who might not have thought before about creating an LPA. Second, we aim to show how easy it is to make an LPA using the online service. Then there are other illnesses, such as cancer or heart disease, that can leave us reliant on other people to make decisions happen. Similarly, every 90 seconds, someone is admitted to hospital in the UK with a brain injury: traffic or contact-sport accidents are examples of what can go wrong and hamper our ability to make decisions temporarily or permanently. Yet another group who could benefit from an LPA include parents with young children. They might want to make sure their kids are looked after how they’d want in case they can no longer look after them themselves. Potentially everyone, in other words, could benefit from making an LPA: you only need to be 18 or over to apply. 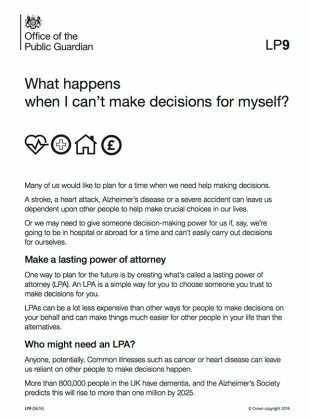 Our new leaflet goes on to point out that the online LPA service, launched in 2013, now makes it easier than ever for everyone to make one. The digital service is designed to make it really hard to repeat the common mistakes people make when creating an LPA using paper forms. It also has plenty of plain English guidance that pops up at each stage and helps you through vital questions such as making decisions about life-sustaining treatment. A final bonus about creating an LPA online? You can save your form at any point as you go along and log back in to complete it when you want to. The leaflet also tries to dispel a few myths about lasting powers of attorney. It points out, for example, that an LPA doesn’t mean other people have total control over you – one fear that LPA research has unearthed. Your attorneys must still try to consult you even when you have lost mental capacity. Nor, we say, are LPAs only for people with complicated finances or lots of money. You can create an LPA no matter what the size of your estate. Or you can create one for decisions – about your health and personal care – that aren’t to do with money. And contrary to another perception, the leaflet says, you don’t need a solicitor to create an LPA. The online service is intended to make it even easier to make an LPA yourself or with the help of friends or family. The leaflet, finally, reminds people what happens if you don’t create an LPA. If you lose mental capacity, you’ll no longer be able to decide who makes decisions for you – without an LPA, strangers might make those crucial decisions instead. Moreover, if others have to go to court to make decisions for you, it can be a lot more expensive than the £110 LPA processing fee. You can download a copy of the leaflet from GOV.UK.